Next time you get invited to a housewarming party, or friends of yours settle on a new place--consider giving them the ultimate gift. The New Homeowner Kit shows that you care about their safety and well-being above all else. Besides--the products all included in this kit are products every homeowner truly needs to be safe. 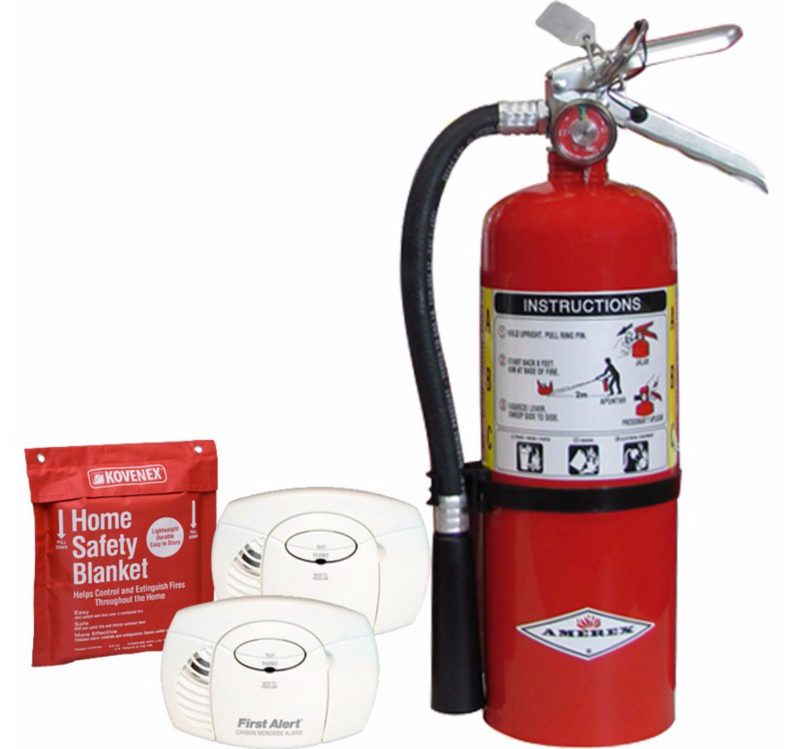 If you're a new homeowner and are currently without a good Fire Extinguisher, Carbon Monoxide Detectors, and a home safety blanket, snag this kit! It'll be worth it when danger strikes. These essentials should be in every home! Carbon monoxide detectors save lives each and every day. They help provide early warning for the deadly danger of carbon monoxide. With a small ounce of prevention you can help protect the people in your life. First Alert carbon monoxide detectors are designed to protect you and your family. This high quality blanket comes in a handy storage bag, which can be mounted in an easily accessible area until needed. Simply pull open the hook and loop secured front and gain quick access to the Kovenex Rapid Response Blanket, for a more effective first response to smother the fire. Great for placing on a tarp in front of the fireplace during a chimney fire. The Kovenex Rapid Response Blanket is an essential home fire safety tool. ABC or Multi-Purpose extinguishers utilize a specially fluidized and siliconized mono ammonium phosphate dry chemical. It chemically insulates Class A fires (ordinary combustibles) by melting at approximately 350° F and coats surface to which it is applied. It smothers and breaks the chain reaction of Class B fires (flammable liquids and gases) and will not conduct electricity back to the operator. You can't afford to be without the New Homeowner Kit. Grab yourself and a friend one on TheFireStore, today.